Colleoni is a truly historic Italian restaurant where you’ll essentially never have a bad meal. It is a bastion of ultra-dependable, traditional cooking where locals and their families have been feasting happily for decades, and so should you, any chance you get. The fact Colleoni is located in Bergamo, one of Italy’s most beautiful cities, only makes a visit more interesting. There are restaurants you might go to once in your life just to see what all the fuss is about (Atelier in Paris, Cracco in Milan) only to never go again, or those you might want to give one last chance to should you happen to be in the vicinity (sticking with Italy and France, Uliassi or Drouant come to mind, for example, but I am sure readers have their own long list of such places). And then there are restaurants you never tire of, where you go time and time again for a variety of reasons (because the food is so good, or the wine list incredible, or service top notch, or for the memories that come back every time you walk into the place). 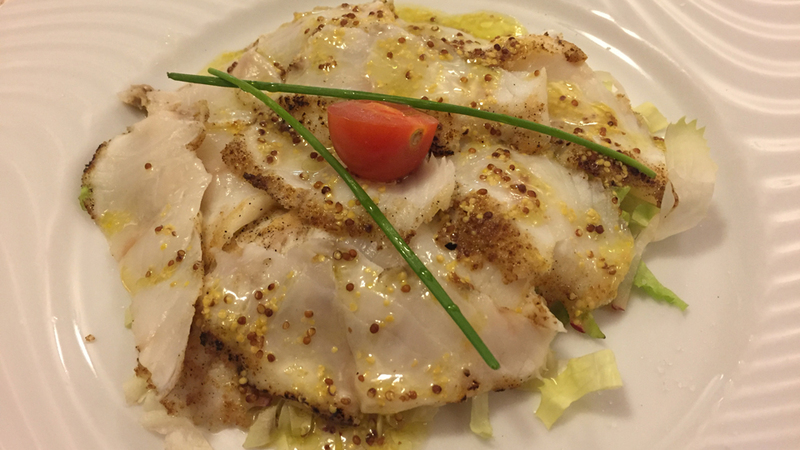 Ristorante Colleoni Dell’Angelo in Bergamo, better known simply as Taverna del Colleoni, has been around since 1744 and obviously knows a thing or two about cooking and keeping guests happy. In fact, not just I, but entire legions of Bergamaschi (the inhabitants of Bergamo) flock to this ultra-traditional, laid back, very Old World restaurant that seems frozen in a time warp, housed in a beautiful 14th century Bramante-designed building that was much admired by Le Corbusier, the famous modern architect. Inside, Colleoni boasts a bright, large and spacious room, highly trained professional waiters who dress the part, a gentlemanly maître who’ll likely remember your name should you visit more than once, beautiful linens, and very large tables (even for two people) set miles apart from those of your neighbors. These are just some of the many things to recommend this chic dining establishment. Of course, at Taverna del Colleoni it probably wouldn’t matter if tables were set close to each other, for regulars and tourists alike are well behaved, contributing greatly to the quiet and distinguished atmosphere. 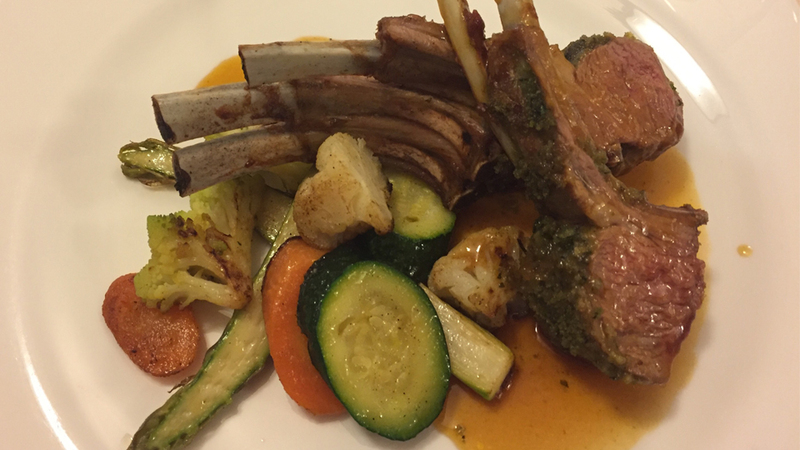 The food is the high point at Taverna del Colleoni, as chef Pierluigi Cornaro is a true talent. Actually, on my most recent visit I was surprised just how fish-centric the menu was. Admittedly, a springtime visit is likely to be met with more seafood dishes than usual, and so be it. Colleoni however always offers a short section of the restaurant’s classic recipes; a good thing, since many are memorable renditions of classic dishes from this part of Italy and shouldn’t be missed. Take for example the casoncelli ravioli with butter and toasted almonds. It's about as good a take on this archetypal Bergamo pasta dish as I remember having in some time. What stands out most about this dish is the lightness of the casoncelli, a ravioli-like, half moon-shaped pasta the recipe of which varies from city to city in this part of northern Lombardy (the pasta itself is always made with water, flour, eggs, and salt, but the filling - usually a mix of bread crumbs, vegetables, meat, cheese, spices - while sauce can change quite a bit). Did you know that casoncelli are the ancestors of all Italian filled pastas, and were created long before tortellini and agnolotti? 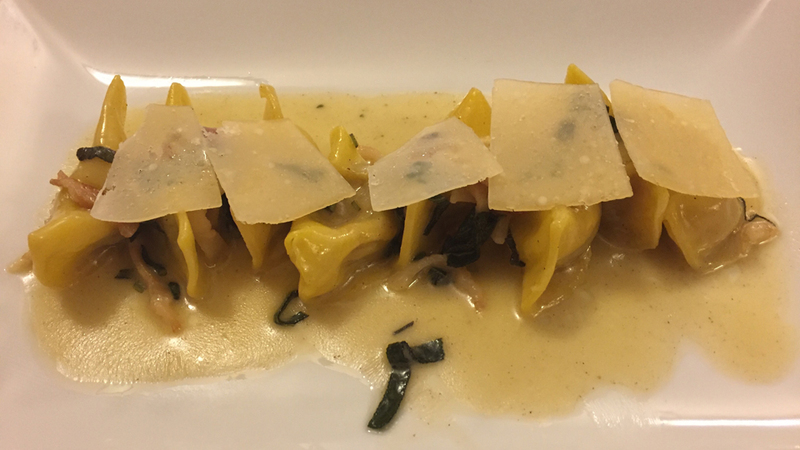 Their existence as such was documented as far back as 1366 and the original recipe is found in Bergamo’s, where casoncelli are accompanied by a sauce usually consisting of butter, sage and bacon. Clearly, the specific lightness of being of Colleoni’s rendition is no small feat, because any self-respecting casoncelli dish involves hefty doses of bacon and butter; so it’s not exactly a light pasta. Yet, at Taverna del Colleoni the casoncelli are almost airy, and you’ll find them sliding down your throat so quickly you’ll be wondering if your plate had a hole in it. 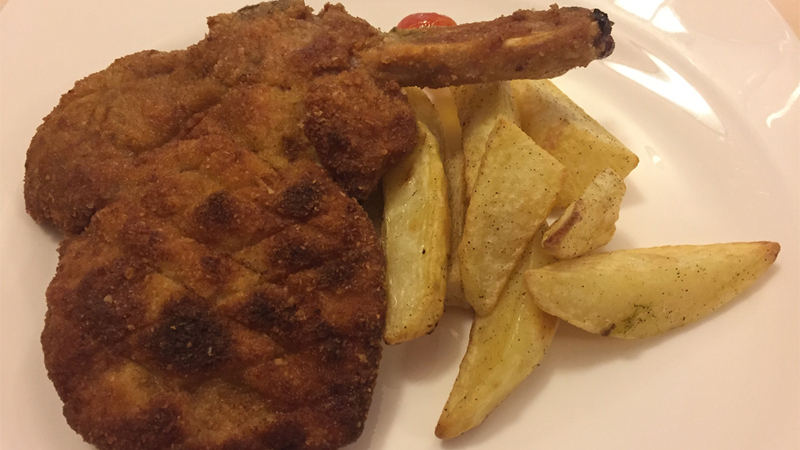 Breaded Milanese-style veal chop served with roasted potatoes is another classic of Milan and northern Italy. Colleoni’s version is not just big, but again, as good as you are likely to eat anywhere. The breading is crisp and flavorful, the meat thick, tender and moist, a breading-and-meat combination not so easy to achieve. 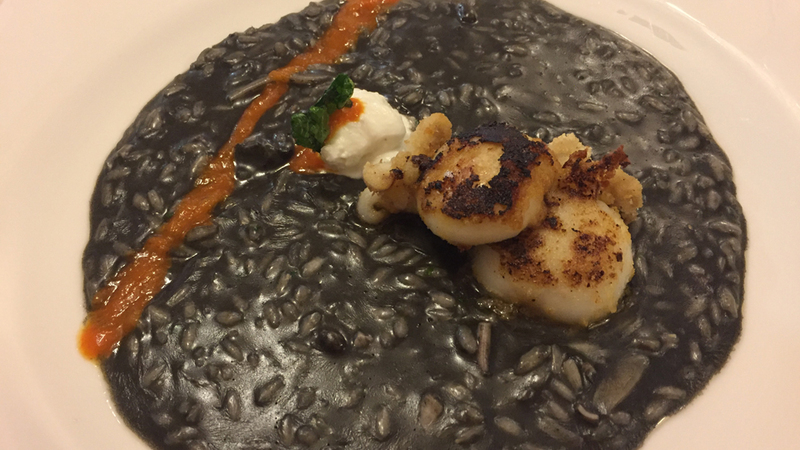 Other dishes such as the squid ink risotto with ricotta and grilled baby squid and the Provençe herbs-crusted rack of lamb and baby vegetables leave everyone at the table satisfied and satiated. As usual in many Italian restaurants, Colleoni’s wine list, though good, could use a reboot. There’s nothing inherently wrong with it, but a few more choices in each Italian wine category would only improve things, and adding a few more quality foreign wines would also be a good idea. The food here is so good it’s a shame not to be able to pair it with even more interesting wines, though the selection is ample enough to satisfy most visiting palates. Then again, I imagine that Taverna del Colleoni’s regular, mainly middle-aged and slightly older clientele might be less adventurous in their wine hunting for their probably classic tastes. Two things worth noting about the wine list is that it does boast some older vintages worth pursuing and that it pays attention to noteworthy local producers. This is an important aspect of any restaurant, as such thoughtfulness allows those visiting to try hard to find, small production wines that one would have no chance of tasting back home or by now un-findable older vintages of the rich and famous. And so the 2015 Caminella Vino da Tavola Bianco Luna Verde and the 2011 Pagnoncelli Folcieri Moscato di Scanzo provide the more curious amongst us restaurant-goers with the option of trying little known but delightful wines. The former is a delicious but relatively simple white wine that makes a splendid aperitif, redolent with bright citrus and floral aromas and flavors lifted by bright acid and stainless steel personality, while the latter is one of Italy’s absolutely best and least known sweet wines. Pagnoncelli Folcieri is arguably the best estate of all the Scazorosciate DOCG, a lightly sweet (about 100 g/L residual sugar) red wine made with the rare but extremely high quality Moscato di Scanzo grape, another of Italy’s almost innumerable native grapes. I personally adore Moscato di Scanzo, finding the better versions to have a mesmerizingly penetrating nose of red roses, lavender, cinnamon and red berries, a relatively luscious mouthfeel, but also plenty of floral lift on the vibrant finish so as the wine seems less sweet than it really is. 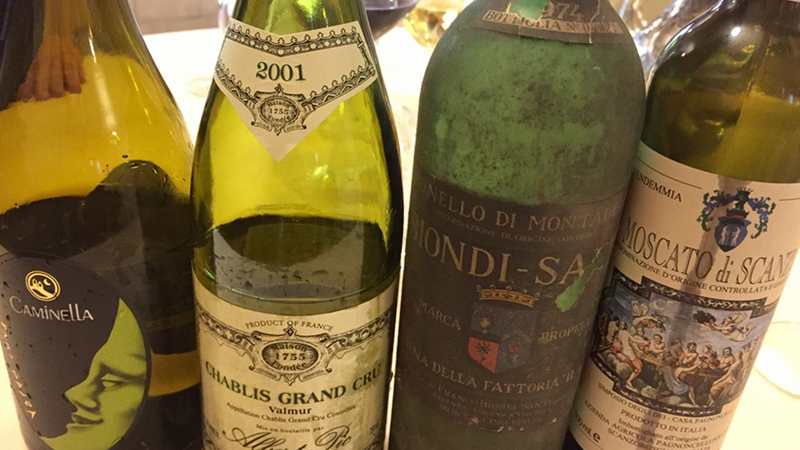 The 2001 Albert Pic Chablis Valmur and the Biondi-Santi’s 1974 Brunello di Montalcino are noteworthy examples of some of the older vintages hanging on the wine list at Colleoni that diners might like to pounce on, especially since bottles have been obviously well stored. The former exudes the Valmur-typical richness and mouthfeel, coupled with age-induced honeyed and buttercomb nuances, with no signs of premox, while the latter is a simply splendid bottle of Sangiovese from the old master, Franco Biondi-Santi. Decanting allows some reductive underbrush and mushroomy notes to clear from the Brunello, leaving glorious red berry, licorice and tea leaf aromas and flavors behind. Bergamo is an unbelievably beautiful city that contributes to Italy’s reputation as a country of almost unparalleled artistic beauty and Old World charm. It offers a great deal more than just a bevy of truly fine dining establishments. It is divided in Bergamo Nuova, or Bassa, and the old town, Bergamo Alta (Città Vecchia) that can be reached only, believe it or not, by a skilift (funicular) or taxi (unless of course you are a resident and have a pass). Both are quite beautiful in their own way, but clearly Bergamo Alta is one of the most delightful places you’ll ever visit in Italy. Just some of the things worth seeing might include the Duomo, the San Michele al Pozzo Bianco church boasting numerous beautiful paintings and frescos including some by the master Lorenzo Lotto, and the Basilica di Santa Maria Maggiore (Saint Mary Major) built from 1137 to the 15th century on the site of a pre-existing church with an external Romanesque façade and structure, as well as a gorgeous dome frescoed by, amongst others, Giovanbattista Tiepolo. The Cappella Colleoni (Colleoni chapel), attached to Santa Maria Maggiore, is one of my favorite buildings in Bergamo, a marvelous example of Renaissance architecture that is home to the tomb of Bartolomeo Colleoni, a famous warlord of the Middle Ages and famous Bergamo native (and after whom the Colleoni restaurant is named). Last but not least, Bergamo also holds an important place in music history, and in fact you’ll be able to visit Gaetano Donizetti’s tomb in Santa Maria Maggiore. Trust me: I grew up in Bergamo, and I go back there every chance I get. My bet is you will too, once you get to know its unique combination of fine art, small city charm and very fine restaurants, such as Colleoni Dell’Angelo.